This Zeist Armories Highlander Sword Review was originally intended to be published in Irish Fighter Magazine, for which I have the privilege of being the chief contributing writer. It was intended to be a glowing review, full of positive praise for what were to be the crowing blades in my collections. Unfortunately, my early anticipation and excitement become soured by consistent disappointment, legal battles. Ultimately, before I received the swords, they had been sullied by terrible customer service. This Zeist Armories Highlander Sword Review documents not just the swords quality but also the lengths I had to go to - including contacting the FBI - to get these swords. When they eventually arrived it was with a sigh of resignation rather than a cry of delight. However, I was committed to an objective review of what were supposed to be among the finest crafted functional Highlander style swords available. Sadly the swords would turn out to be as disappointing as the service I received. Click on the Image Below for a gallery of all the Highlander Katana Images in High Resolution. As a martial artist since the age of four and as a huge fan of Kurosawa movies, I had always been a fan of the martial culture of the samurai. 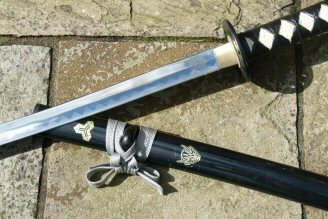 However, it was not until I saw Highlander and Conor MacLeod’s famous katana that my love of the Japanese blade truly developed. 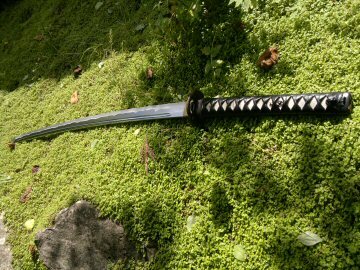 When I was 18 and knowing nothing about swords I bought my very first katana – a cheap Chinese reproduction of the MacLeod sword. Since then I have acquired a large collection of reproduction movie blades, Iaito and Shinken and have taken up dedicated study of Musō Jikiden Eishin-ryū (無双直伝英信流). 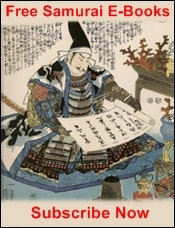 I’ve also had the privilege and joy of studying some of the great katana of history via the Chester Beatty Library here in Dublin. While as far away as possible from having any decent knowledge or expertise of katana, I know just enough to tell if something is well made, and see some of the more obvious faults. I have held enough blades and done enough cuts to have a rudimentary understanding of balance in a blade, and felt that now, at 30 I could rectify the mistake I had made previously and get myself a true Conor MacLeod blade. And so to research I went. I corresponded with each and felt I would be best served in acquiring a functional version of the Conor MacLeod katana that closely resembled the movies with Zeist. This is primarily due to 2 factors, the extremely helpful responses I got from Benjamin 'Shinsei' DeLeon and the stunning workmanship of Jose de Braga's tsuka, which is a high point in this Highlander Sword Review. There was also a touch of authenticity here in the lineage – de Braga having carved the handle for the Highlander 3 Conor MacLeod katana. In every respect possible – this would be a true functional masterpiece. As many reading this Zeist Armories Highlander Sword Review will be familiar with, the Conor MacLeaod katana of highlander fame is not a traditional Japanese blade. 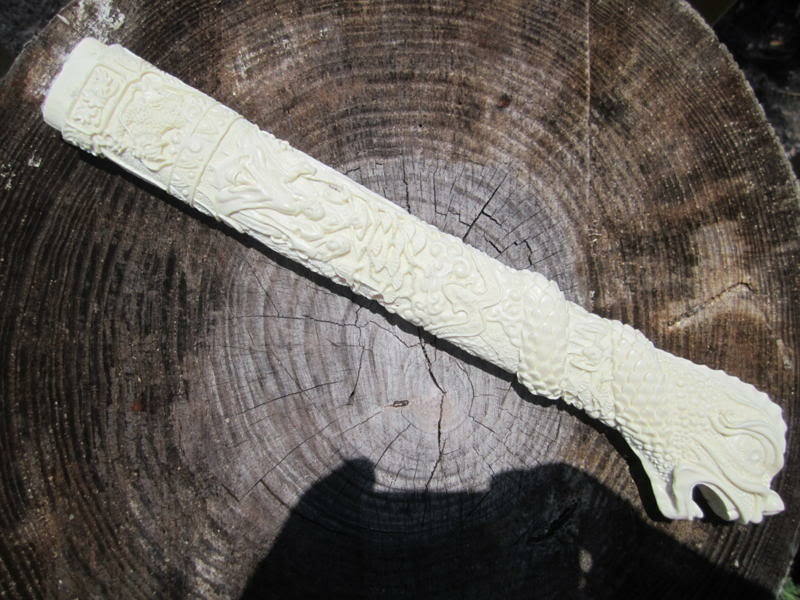 Aside from the mythology presented in the film, no functional blade would have been carved from ivory, nor would it be presented in such an intricate fashion. The history of the blade is exhausting, and only for those truly interested in Highlander more so than anything – however, more fake, cheap, rat-tail, 440 stainless steel wall hanger versions of this sword exist than any other out there. It is nearly viral. Outside of the obvious poorly made knock-offs, official versions exist courtesy of Makarto of Spain. At some point I will write a up a complete Highlander Sword Review of these blades. Suffice to say they are not suitable for Tameshigiri (試し斬り), nor are they suitable for Iaido (居合道, Iaidō). Today a version by Kit Rae is available, and while I have not had the pleasure of holding one, from the detailed images I have seen, it has neither the high level of detail deLaVega’s sculpt possessed nor the accuracy to the film I had wished to see - most importantly it was not customisable to the specifications I wanted for a functional, usable blade. Zeist Armories it seemed provided the most authentic functional reproduction with the reassurance of their unique SanMai upgrade with the Kevlar and Carbon, and certainly the most sculpted and beautiful tsuka design. I fired my first email off to Benjamin 'Shinsei' DeLeon on 5/31/10 with some info request and he responded with an extremely helpful and detailed guide as to the swords, the blades and the customisation options. Taking things through with Ben over the days and weeks that followed I could not fault him for his enthusiasm and willingness to accommodate and guide me. It did take Ben a week to get back to me from my initial customisation requests, perhaps that should have been an early warning, but I was excited and enthusiastic on commissioning this project and perhaps that interfered with my better judgement. However, after some prompting from me, get back to me he did, with much awesomeness. We discussed the differences between the Mater and Masamune Editions of the sword. The Master Katana had the highest level of detail, a more traditional, slight curving to the tsuka. The Masamune by contrast had less detail and a slightly thinner tsuka, although the brass Mekugi (目釘) pin was more accurate to the first movie. The images below were sent to me by Ben to highlight the differences. As regard the Tsuka (柄) both were carved by Jose de Braga to be idealized versions of their respective movie swords. The Masamune being the first movie and the Master being the third movie. I felt the Master was far more beautiful. The detailing of the scales and dragons head was far superior from the photos Ben showed me. I also had a choice of tsuba, choosing between a Ramirez style as seen in the first film and the simpler Conor style as seen in the third movie. Again I felt that the third movie style showed the superior craftsmanship and was more consistent with the build. 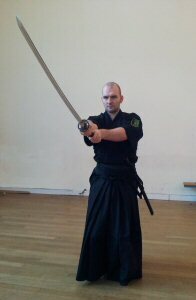 Meanwhile Ben had sourced the Iaito balde with Bo-hi and the Shinken blade in the lengths I had specified. In addition Ben was EXTREMELY helpful with the legal side of things. 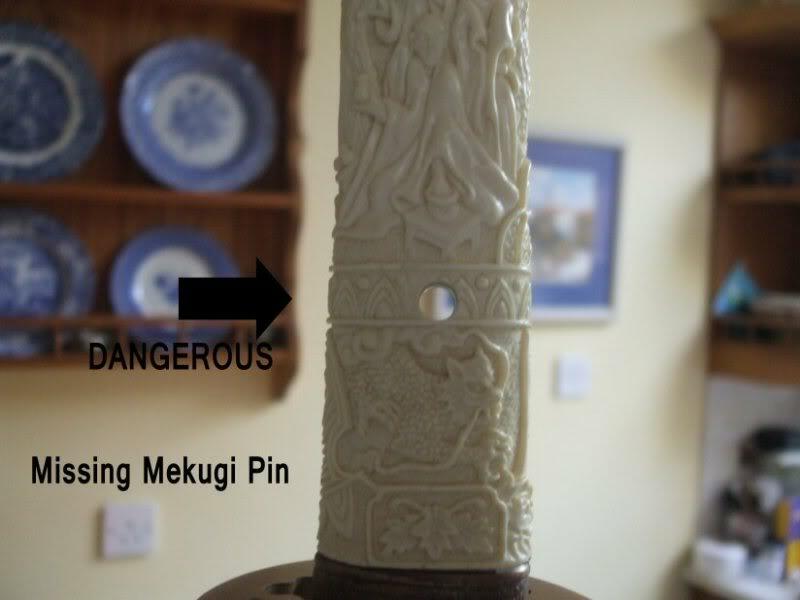 Legislation has recently changed in Ireland and “samurai swords” were now illegal. However, as secretary of the Iaido Association of Ireland at the time and as a writer for Irish Fighter magazine I was able to organise for the importation via the Dept. of Justice. To be compliant however I needed documentation from Zeist Armories as regard the production process. Ben secured this for me without any hesitation. In this regard the customer service from Ben and thus Zeist Armories had been exemplary. The blades were selected and I upgraded to brass tsuba’s for both In the Conor style to match the Master sculpt handles. This was finalised on the 10rd of June. After paying the deposit I heard nothing more till I chased Ben 2 weeks later. The blades had arrived from the forge and I was promised more frequent updates. A few days later Ben informed me production was being delayed due to a hurricane. I appreciated him keeping me in the loop and he emailed me again when production was due to resume 13th July. On the 4th of August, Ben emailed me to say the swords were complete and ready to shipped. He even sent me a quick snap of the Iaito he took with his phone. I paid the balance with delight. At this stage my dealings with Zeist Armories and Ben had been exemplary and I was impressed with how smoothly and pleasurably things had gone. Once they had all my money however, things quickly changed. The swords were due to ship on the 9th of August. They didn’t. I emailed Ben on the 11th, and he got back to me a few days later letting me know there had be a problem with Fed Ex. I emailed Ben again a few days later after he said he would get back to me tracking numbers after the shipping dates. More problems. No shipping. I contacted them again a week later. More problems. Still no shipping. I was told Fed Ex didn’t like the packaging. I was getting a little frustrated. It was now 3 weeks since they were due to be shipped. As you can imagine I was getting frustrated. Even now, a year after the fact as I update this Zeist Armories Highlander Sword Review I still get irritated at the thought of my treatment by this company. More emails and more excuses followed. Each time I had to chase up Zeist Armories. To be clear I wasn’t emailing every day or anything like that. They would tell me a date on which they would get back to me. They wouldn’t email. I’d wait a few days give them the benefit of the doubt. Nothing. Generally I was emailing once every 7 days. It got to the stage where only demanding a refund did they answer my emails. “What you are doing is fraudulent and plain theft. This suggestion essentially amounts to blackmail and I am disgusted with it, you and your company. It strikes me now that perhaps I was lied to outright the entire time. The various emails from Ben explaining the ongoing delays in the project allowed you to secure the initial payment outside of the 45 day PayPal window. Do you dupe unsuspecting and trusting customers with this scheme often? The fact that you would attempt to place me in this position sickens me. The swords I was so looking forward to wielding are now permanently stained and soiled by your reprehensible actions. How could I possibly derive enjoyment and value from them knowing that its makers conduct themselves with such dishonour and dishonesty, and treat me with such a lack of respect and decency? You should be ashamed of yourselves”. “I do sincerely apologize for that delay, I just hope that when you do receive your swords that you can look beyond all that negativity and appreciate the swords for what they really are. I am tell you this man to man, not as an employee of Zeist, but as a fan of these swords. They are YOUR swords. Custom made for you. Not for anyone else, not mass produced items lying around waiting to be shipped. They were made for YOU. And honestly, I don't think we've put out better looking swords than the ones you are going to receive. And that's not just blowing smoke, they are really beautiful swords. So regardless of what you think of us as a company, or me as a person, I hope you can look at the quality in which they were made and appreciate them as such. I wrote to Ben, expressing my own disappointment, but that I held him blameless, and that I too hoped his belief in the quality of the swords to be genuine. The swords did subsequently arrive…and now finally…I can move to the heart of this Zeist Armories Highlander Sword Review – the swords themselves. Blade width at Kissaki: 0.916"
Blade thickness at Kissaki: 0.231"
The items were well packaged, and secure. As much as I wanted to be excited about them I wasn't. On opening the packages and inspecting the swords I kept in mind Ben’s words from the emails - hoping that perhaps the quality was to the standard he claimed and that these were going to be finished to a high standard. Again, as had become the pattern with Zeist Armories I was disappointed. 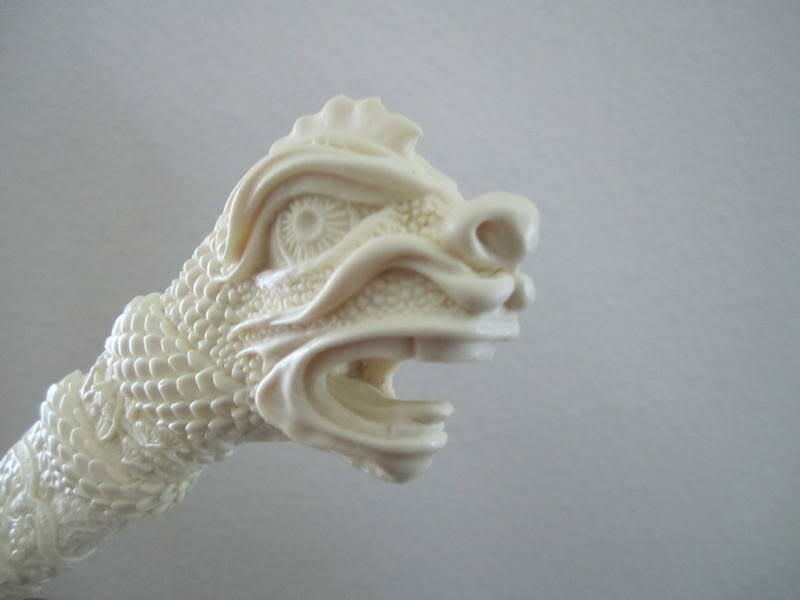 While the tsuka have incredible detail and are carved beautifully, they were not affixed to the swords correctly. 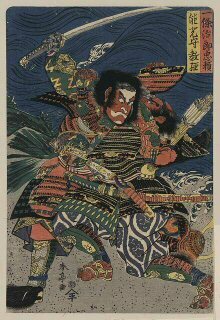 In particular the shinken has a number of minor and 2 serious problems. The tsuka is not aligned correctly with the hababki and blade and most severely it's missing the mekugi peg. I have attached photos of this. In addition the blade is slightly bent to the left. 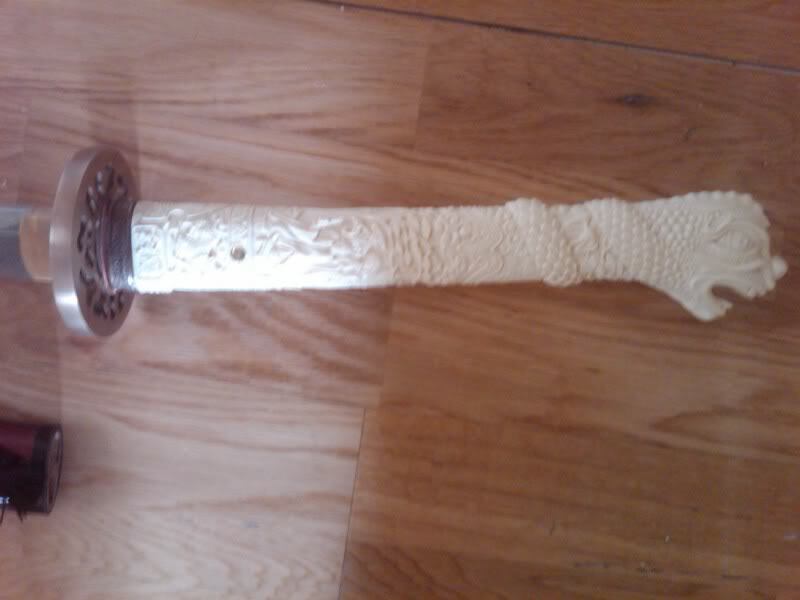 Even given the claims on the website - given the experience with Zeist Armories I have no confidence in the blade and handle to withstand a cut and the simple fact that it is missing the peg that holds the blade in should your "core" not act as claimed - means all I have is an expensive wall decoration - not a sword. There's no way that could be used for cutting practice in its present state. I would have no hesitation in returning it except I wouldn't get my money back. At least this way I have an example of a poorly made sword I can show my students and warn them. It can also use this Zeist Armories Highlander Sword Review as an example of serious issues and common defects in custom blade work so I suppose that's a plus too. The minor problems are cosmetic finish issues, the saya and tsuba are rough in parts, and have not been finished correctly. The Tsuba is scuffed, black and tarnished in some places. The handle itself, so excellently carved is also black and scuffed ruining what would be a majestic appearance. Overall I am disappointed with the sword. It can't be used and even as an art piece is second rate due to the lack of proper care and attention to detail. The iaito is surprisingly better fitted to the blade, but again suffers in the scuffed black aspects of the tsuka, and the tsuba is also scuffed and tarnished. Here the balde is also slightly bent to the left. 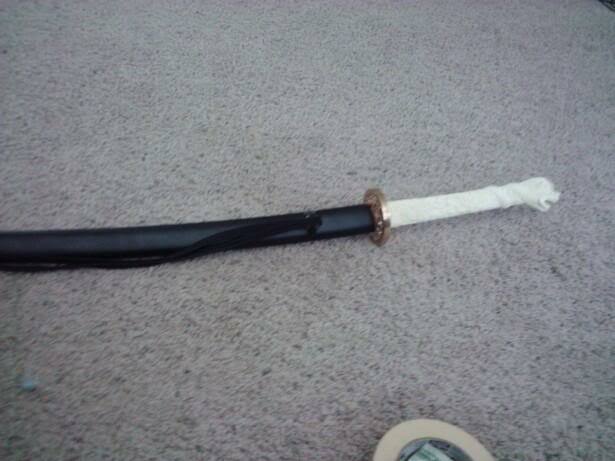 In addition the saya, which has a cheap nearly plastic feel and appearance is unfinished and un-sanded. The Koiguchi is un-sanded and has scuffed the habaki. 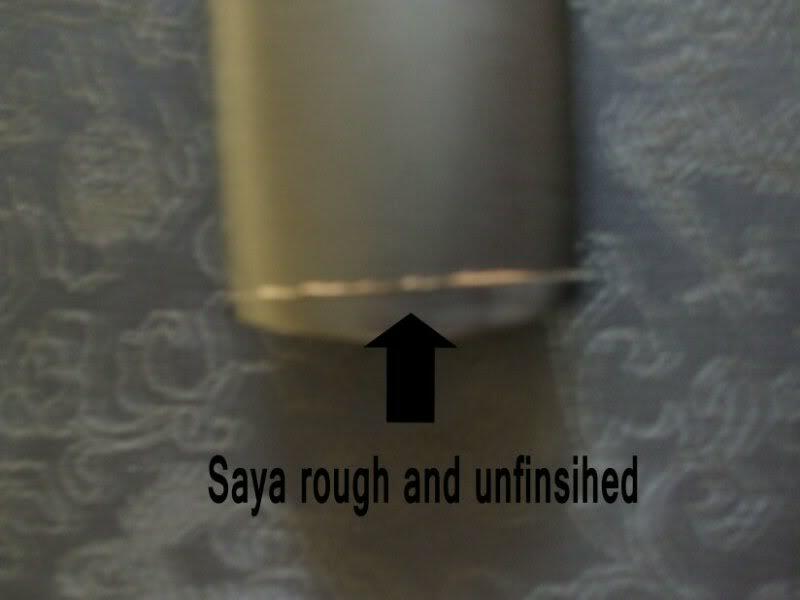 Further the saya is chipped in 2 places. All in all, the initial joy and enthusiasm which I had for this project is long gone, the hassle and problems caused by Zeist in their failure to ship the product severely crippled it. If I had the choice I would not have accepted these and just taken my money back - but that was denied me by Mike and I was blackmailed into accepting them. My only last glimmer of hope was that garnered from Ben’s last email - that these even with all the problems experienced and the dishonest and dishonourable treatment I received - the swords would be perfect. Instead there are serious structural and cosmetic flaws, more problems and sloppy work. I am truly truly disappointed, and for a fan of the highlander series and a dedicated sword enthusiast to have been treated in such a way and to receive such work is an insult. A more detailed Zeist Armories Highlander Sword Review of the blades and the swords components follows. The Blades were not made by Zeist Armories, nor was I able to obtain the identity of the manufacturers. The following is based on the details provided to me by Ben. The blades are hand forged from select billets of either 1060, 1095 or T10 Steel. In this case T10. The steel was then heated to the proper temperature and hammered by hand into shape. After this, the sword was then laminated with other steels (San Mai), and forged Folded creating a Hada (wood grain pattern). The forged blade was sculpted close to its intended shape and then water quenched, in accordance with Japanese tradition. Following tradition the blade was then be treated with a clay covering, applied to the entire sword except the cutting edge. The blade is then heat treated and quenched in water. The combination of the quenching and the clay cover creates a significant temperature difference in the Ha (cutting edge) and the rest of the sword. The result is the creation of the Hamon, which runs all the way up to the Kissaki (tip) of the blade. The blade was then hand polished, the habaki and saya fitted. After this both blades had the tangs wrapped in the unique Kelvar and Carbon fibre core. The blade of the Shinken arrived absolutely filthy. 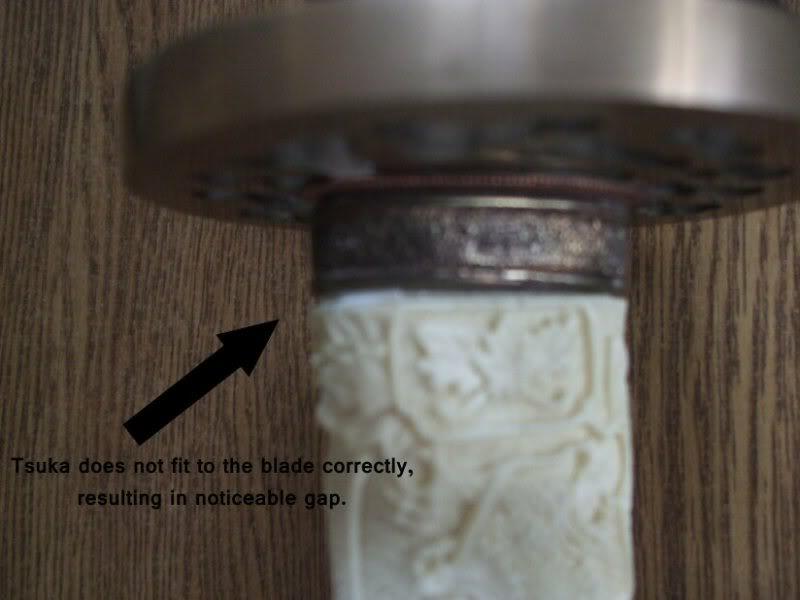 There was also notable damage to the kissaki of the blade itself aside from the overall blade being warped to the left. Taking time to gently clean it there are some notable features. The hamon is of the Sudareba style (Bamboo Curtain) so named as it mimics sections of bamboo in parallel lines along the hamon. It is not entirely consistent but beautiful for that, the diving line moving in a regular wave form (Midareba-Gunome). The Hada, or grain pattern presents is a straight grain(masame), like several panels of wood laid upon each other running parallel to the cutting edge. The kissaki unfortunately features a number of small defects, most notably “fukure”, or air pockets, which detract from the blade and indicate possible structural weaknesses in the blade itself. Another reason I would feel unable to cut with this blade. Most notably in difference to the Shinken is the bo-hi (groove). The hamon here is of deep extremely regular waves, small hillocks play across the light (Midareba-Gunome), and but for its extreme regularity and conformity would perhaps edge towards a clove or choji hamon. As in the Shinken the The Hada, is a straight grain (masame). Both feature medium curve kissaki. God lord these are beautiful. On both the Iaito and the Shinken the craftsmanship and skill is undeniable. The texture and detail is simply breathtaking and upon each viewing I get deeper lost and discover new depths in this work. It is clear that Jose de Braga is a master craftsman. Considering that this is the principle reason I purchased these swords a detailed examination of them is warranted for this Zeist Armories Highlander Sword Review. Each and every detail here is fully realised, from the small dragon crouched about the leaves to the facial expressions of the priest’s, mendicants and patrons. The trees the leaves all veined and expressed. The scales of the dragon fully in three dimensions, layered upon each other evoking ght e sinewy movement coiling around the tsuka. The dragon’s head itself is spectacularly the head is fully detailed, with no aspect missed. The irisis of the eyses and full carved, the roof of the mouth, scalled and expressed, the teeth, tongue, nostrils, everything in perfect symmetry and detail. It is simply staggering. The feel of the tsuka is unique, simply put no other blade could have this texture; the fine depth of the engraving, the width, comfortable in the hand affording the practitioner a comfortable if unfamiliar grip. 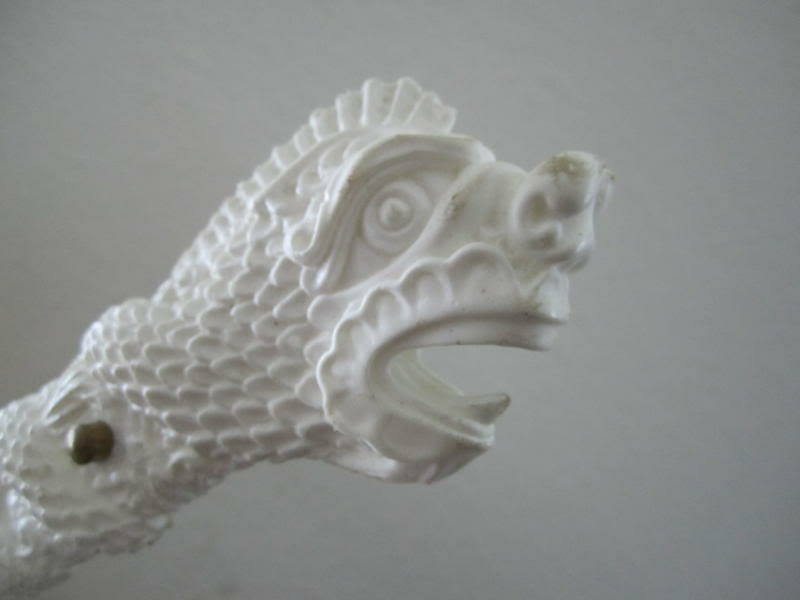 The colouring and feel does replicate ivory nearly indistinguishable and the unique casting process removes any traces of seam lines, thus creating the illusion of a personally hand carved piece. Sadly the mekugi – while suggested as unnecessary due to the Kevlar / carbon core are brass are ill fitting. In fact the shinken’s falls out constantly and has grip at all. In fact both mekugi were missing upon arrival. I later found them in the bottom of the cloth sword bags. The slightest tap results in their falling out. This is both disconcerting and aesthetically embarrassing. Finally the tsuka of the Shinken is not fitted correctly and there is a significant gap between the tsuka and the seppa. This gives rise to the suspicion that the blade is not nestled correctly in the tsuka, combined with the warped blade, air-pockets, and faulty mekugi, I wouldn’t trust this word in test cutting. Considering that’s why I bought it renders the sword nothing more than a very pretty and expensive wall hanger and I have enough of those. I cannot adequately describe my disappointment to find that my new Shinken is unusable. In both swords I opted for the Conor style tsuba. To better appreciate the contrast and for the purpose of this Zeist Armories Highlander Sword Review I have included pics of the Ramirez tsuba as well. Despite the beauty and authentic size of the tsuba they create a HUGE problem with the functionality of the blade. In my swords they are solid bronze, just under a cm think each. They are QUITE heavy, and more than enough to completely throw off the balance of the blade, rendering them awkward and unseemly to wield. In addition, both were rough and unfinished in sections, scuffed and dirty. The Iaito in particular has several deep gashes that reveal the lazy and slap dash method by which they were made. Little care was taken to finish them. There is no pommel as such, and the dragons head has already been described above. The Saya are both wood and both partially unfinished. On the positive aspect and burgundy colouring of the Shinken saya is gorgeous. It is a breathtaking colour, resplendent and deep. Sadly the koiguchi is rough and unploshied and has scratched the habaki. The saya of the Iaito is unremarkable. It has a matte black finish and has been treated in such way as to give the appearance and feel of plastic. This saya too has been poorly finished. 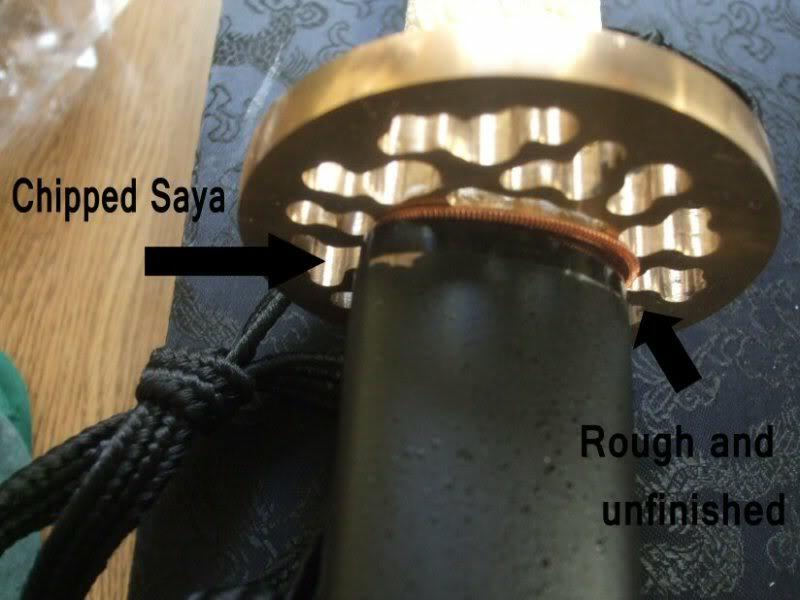 The saya is chipped in several locations, small cracks appear near the kojiri and the the koiguchi is rough and unpolished and has scratched the habaki here as well. Ah handling. These swords, something I highly anticipated and relished practice and cutting with are simply embarrassing. The problem is two-fold. Firstly the weight of the tsuba’s as mentioned previously displace the blades natural balances point, the majority of the weight is firmly located at the tsuba itself. As a result, proper cutting technique needs to be modified and disrupted. The same is true when performing chirburi and noto. This leads to a clunky forced appearance. Many of my fellow students have tried the sword only to smirk afterwards and hand it back with words testifying to the feel of this ungainly monster as stated above. The second and most severe problem is the warped blade on both. 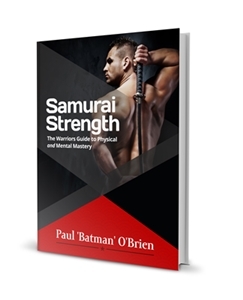 This completely removes any possibility of cutting with proper hasuji, rendering the Shinken useless for cutting practice and the Iaito for waza practice as the bo-hi only creates audible feedback when swung incorrectly. A sword that can’t cut right isn’t a sword. God I looked forward to test cutting with this shinken. Having cut for years with a variety of Paul Chen blades, I was extremely excited to cut with the near mythical functional highlander blade this promised to be. Sadly, the misaligned tsuka, bent blade, useless mekugi, and air-pocketed blade renders such practice totally unsafe. A complete waste of the Shinken. It’s clear from the outset how disappointed I am in these swords. Even had the customer service gone smoothly and I didn’t have to report Zeist Armories to the FBI for failure to deliver the product, my initial enthusiasm would have been blunted on viewing the blades. Small cosmetic details like the scratched and scuffed tsuba, the chipped saya, could easily be over looked and touched up. An air-pock marked blade, bent blade and poorly fitted tsuka and mekugi are inexcusable. The blades are fundamentally unsound, and no matter how skilfully de Braga's sculpts are, (and they are astonishingly good), what use are they for a functional katana when the blade won’t function as intended? Ultimately they are stunning wall hangers. But for all the negative aspects – these blades serve me well, not in their intended function I grant you, but they serve as a reminder for me to be more circumspect in my future purchases, and to remember that a fantasy should stay a fantasy, for there can be only one Highlander sword – and it exists only in the movie world. The name really should have told me everything – Zeist was a reference to the worst of the Highlander films, and it certainly will always be a reference to some of the worst blades I have seen and undoubtedly the worst customer experience I have ever experienced. At the time of writing the Zeist Armories website is not up – hopefully it stays down and other unsuspecting and trusting Highlander enthusiasts will not be parted with their money in hoped of fulfilling impossible dream. Spectacular sculpted tsuka. This is the without doubt the most impressive Highlander dragons head sculpt about, with providence, as they are made by Jose de Braga himself - the sculptor of the Highlander 3 Conor MacLeod sword. Benjamin 'Shinsei' DeLeon was a pleasure to correspond with. I would not recommend these blades or this company. As you've seen in this Zeist Armories Highlander Sword Review there are a lot of factors in involved in this. The customer service and shipping was rude and unprofessional. The blades themselves were poorly finished and cannot be used as advertised. Ultimately a waste of money and a complete rip-off. Nothing more than a very expensive, but very pretty, wall hanger. If you want a highlander sword to hang on your wall, the cheaper knock-offs are much better value, and if you want a genuine cutting blade, this won’t “cut” it.